You’ve heard of Ladbrokes, but have you checked out Ladbrokes Bingo? Ladbrokes Bingo is giving away free bingo credits! Simply deposit or transfer £10 into Ladbrokes Bingo and play with £40! The Ladbrokes Bingo welcome bonus is available to new and existing customers! Click here to visit Ladbrokes Bingo. Ladbrokes welcomes all new players to bingo with a £25 bingo bonus, a £5 mini games bonus, and seven days of free bingo in the Ladbrokes Bingo Guest Room! 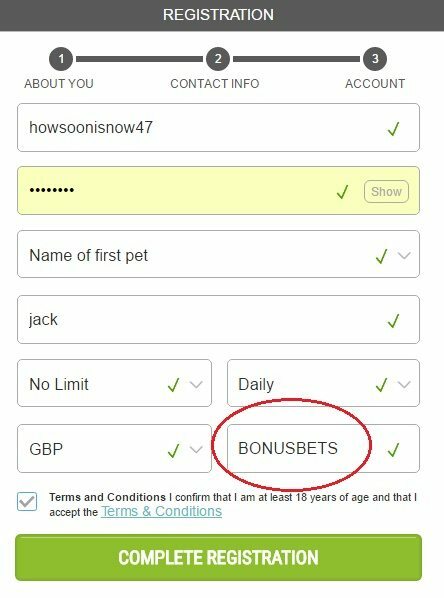 Once you’ve registered an account, visit the Bingo Lobby and create a bingo chat name. Then deposit and purchase £10 worth of bingo tickets and Ladbrokes Bingo will credit your account with a £25 bingo bonus and £5 mini games bonus, for a total of £40! You have 30 days to create your bingo alias and purchase the £10 in bingo tickets to qualify for this offer. Once you have completed this, you will see a message pop-up notifying you of the bonuses being awarded to your account. There are wagering requirements associated with each facet of this bonus. The Bingo Bonus has a 2x wagering requirement associated to it, so you will need to spend a total of £50 in bingo tickets prior to withdrawing any winnings. And the mini games bonus has a 25x wagering requirement. The bonus is available for only 7 days so start playing quickly! Unfortunately, you can’t withdraw the bingo bonuses, they can only be used for play at Ladbrokes Bingo. You’ll have to spend it on a bingo ticket or mini-game, but then any winnings from that can be immediately withdrawn. Note that most small bonuses have a 48-72 hour time limit, which means that you have to play them and not sit on them. The Ladbrokes bingo hall is one of the most popular bingo destinations online. The main reason for that is the company’s reputation for integrity. Other reasons include its stable and secure Web-based software, excellent bingo room diversity, lucrative and diverse promotional structure, and robust community. Ladbrokes Bingo uses the Microgaming platform and is thus connected to the Microgaming bingo network, which allows for bigger progressives. The bingo hall, however, does not require a software client. 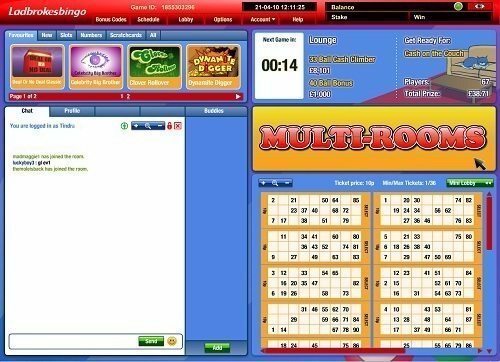 All bingo services occur directly in the browser, which means that you can connect to it as easily with a Mac and Linux computer as you can from one running Windows. Ladbrokes also offers a mobile app for bingo that supports most tablet and smartphone platforms. Ladbrokes offers a robust promotional calendar for bingo that includes progressive jackpots, special jackpots, special events and a lot of free and second-chance bingo. There is also Laddie’s Rewards, which is a lucrative loyalty program that pays you points each time you buy a bingo ticket or play a mini-game. Those points earn you a wide array of benefits and convert into bonuses and cash. Ladbrokes offers the full range of bingo games. The hall puts a lot of emphasis on the classic 90-ball game, but it also caters to players who prefer 80-ball, 75-ball or even wilder variants. The 80-ball game introduces vertical and diagonal lines. The 75-ball game uses patterns rather than lines. A popular 90-ball variant is Deal or No Deal, which adds a progressive jackpot. A popular 75-ball variant is Joker Jackpot, which uses playing cards rather than numbers. The Ladbrokes bingo hall also hosts a wide range of games in addition to bingo, including chat games and mini-games. Chat games help to build a sense of community and pass the downtime. Each chat game has at least a £1 bonus up for grabs, but there are quiz nights and other games where the potential winnings are much, much higher. Mini-games refer to games that you can play while participating in a bingo or chat game. Popular mini-games include roulette, scratch cards and a wide array of slot machines. The Ladbrokes bingo hall has a current schedule at all times that lists the ticket prices and top prizes for each room. In the standard daily rooms, jackpots can range from as little as £1 to as much as £1,000. Ladbrokes also has special jackpots and escalator jackpots. The escalator jackpots are particularly popular because they continue to grow until someone comes along and wins. There are sizable and progressive jackpots available on the chat games and mini-games as well. Ladbrokes has other free offers for you! Be sure to read about the Ladbrokes free bet from the sportsbook, as well as the no deposit bonus offered up from Ladbrokes Games! Join Ladbrokes Bingo and play bingo for free! Download the Ladbrokes Casino at http://ladbrokespokerdownload.net/ladbrokes-casino-download/ and receive a 300% deposit bonus plus 25 free slot spins! Yes, I agree with the previous reviewer, received the bonus as described here and it was very easy, your promo code delivered as advertised, thank you!!! Bingo is very fun, almost addicting in a good way, and really like the games and even some of the other people playing! 5 stars, thanks. Thank you, your bingo bonus is amazing, I received all the bonuses exactly as you described on this page. Love Ladbrokes, thanks!